As long as the resident has NO dementia or issues, this place is probably fine. However, just be aware that they are out for money first and foremost. They will say anything to get you in there (with the non-refundable $2500 activity fee) and then if there are any problems, they don't have any hesitation kicking someone out. We went there to tour it and told the lady who spoke with us (a salesperson, who received a car for selling the most rooms that year) that my father had dementia issues and would try to come on to women. We were very upfront about his issues and did not hide anything because we wanted to be sure this place would be appropriate for him with his dementia. She insisted that this was not a problem, said she'd had a resident grab her breasts and they were trained to deal with this kind of thing. Once he was there and started exhibiting these behaviors, all of a sudden, the manager claimed she knew nothing about his dementia. Then it was about how fast they could kick him out, sadly informing me that the $2500 activity fee was non-refundable, even though he had only been there a few months. We were given a few weeks to find somewhere to move him, and finally found a place in Windsor that accepted him and were actually trained in dealing with dementia patients. The best way to get to know a community is by scheduling a tour. See the facilities, meet the staff and residents, and get a feel first hand what it's like to live at Brookdale Dickinson Avenue Assisted Living. 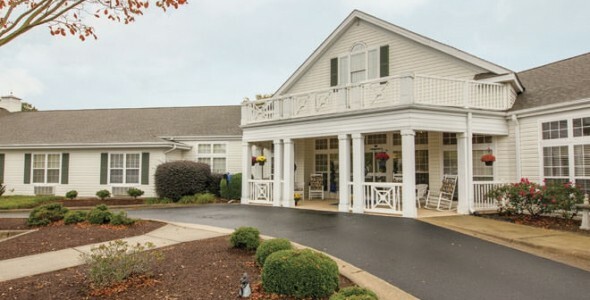 Located in the quiet college town of Greenville, home to East Carolina University, conveniently situated near parks and shopping, Brookdale Dickinson Avenue is an inviting assisted living community which provides personalized Alzheimer's and dementia care options to North Carolina seniors. Brookdale Dickinson Avenue is managed by Brookdale. Brookdale has a long reputation for providing the highest quality of life and services to seniors living in our communities. Our apartments are available in a variety of sizes and styles, and residents have a choice between private and companion floor plans. Our accommodations include wall-to-wall carpeting, private baths with step-in shower, individually controlled thermostats and kitchenettes. Residents have the option to decorate with their own personal furnishings so their room may feel as homelike as possible. Our dining area is a comfortable and easily accessible place to enjoy one of our nutritious, home-cooked meals. We want residents to feel their best, which is why, starting with nutrition, we develop individual fitness and wellness plans to fit each resident's lifestyle. Our staff is trained to provide the best assisted living and memory care for individuals with Alzheimer's and dementia, and licensed nurses are on call 24/7 to monitor any health issues. We offer private, in-home assistance with bathing, grooming, dressing, hygiene and mobility. Housekeeping, laundry services, continence management and medication support services allow seniors to enjoy our community without the worries of daily life. Our scheduled transportation services take residents to and from appointments and social outings. At Brookdale Dickinson Avenue, North Carolina seniors enjoy a worry-free lifestyle surrounded by the beauty and comforts of home.